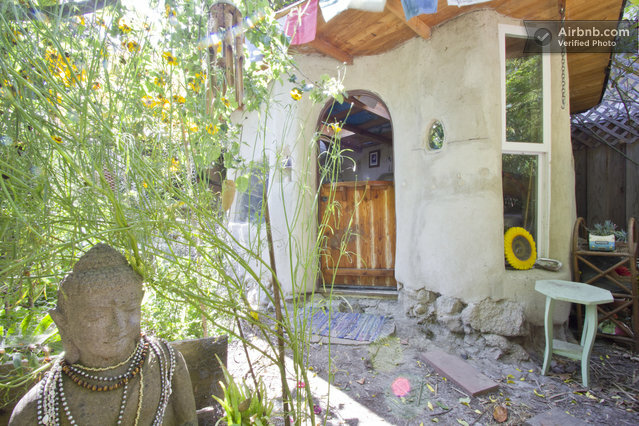 Here’s a great affordable opportunity to try out what it would feel like to live in a tiny cob house and get to spend some time in Santa Cruz as well. “Great opportunity to experience sleeping in an all-natural hand-sculpted stand-alone room with large sunny window and skylights, warm well-insulated floor, view of green backyard, private and sweet. Bed is between twin and full-sized so great for one person and cozy for 2. Possibility of putting a mattress on the floor if desired. Part of an ecologically conscious homestead with a treehouse, streetcar house and another bigger cob studio. We also have a barrel sauna (may be available with advance notice), big trampoline, chickens, 2 ctas,gardens and a quiet, mellow neighborhood off of downtown Santa Cruz. EVERYTHING is in short walking distance (beach, downtown, markets, wildlife lagoon refuge) and we have wetsuits and a few beginner surfboards and boogie boards to lend you. We are just a short walk from bus station, or take train from SF to San Jose ($10 to $15) and then Metro Bus to Santa Cruz ($5) and walk to our place. You wont need your car to visit Santa Cruz or beach! Host is full of information and ideas on food, hikes, nearby visits and local events and has lived in SC for 20 years. Bathroom is in the main house shared with others. Rustic country style living in the city. Safe and secure. Parking permit is $3 for overnight and weekday parking. You’ll want to leave your car and walk! 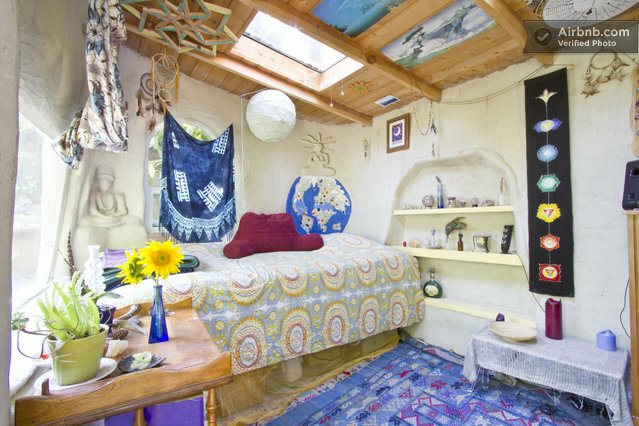 via Adorable intimate earthen “cob”room in Santa Cruz. This entry was posted in Houses and tagged cob rental, santa cruz by Julia. Bookmark the permalink. Very pretty but no bathroom is a “no deal” for me. To me a nice, relaxing, bath alone with a good book is key on a vacation. Laura it’s $65/night. Here’s a direct link to the site for more info. https://www.airbnb.com/rooms/176753 Hope this is helpful. Deborah… I couldn’t agree more. I don’t know why they didn’t just build a little bath house with a composting toilet or something. Maybe there isn’t enough room? Sasha I looked for it again and couldn’t find it. She must of removed it from the listings. Sorry. I’ll keep my eye out in case she adds it again. availability in august? how much per night?